At 118 calories per cookie, these are a bit high cal, but they are so rich and so delicious that 2 definitely satisfy your sweets craving. A large portion of the calories is due to the walnuts in the recipe, but these are GREAT calories full of MUFA. So don’t feel too bad 😉 Serve with a nice Low Fat Latte for a great dessert. Beat butter on high 2 minutes or until smooth. Add sugar and beat until creamy. Add egg and vanilla and then stir in melted chocolate. Finally stir in flour and chopped nuts then cover and chill 1 hour. Preheat oven to 350 degrees and shape dough into 30 balls about 1 inch big and place on cookie sheets. 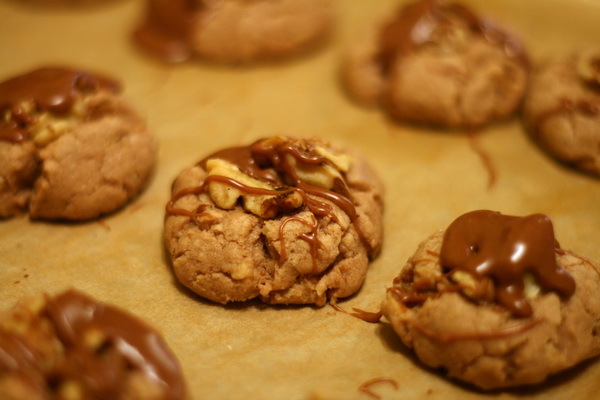 Press a walnut half into each and bake 10-12 minutes and then cool completely. When cool, drizzle chocolate glaze on cookies and let sit until glaze is set. Melt 1 oz. sweet baking chocolate and 1 T butter then add ¼ t vanilla, 1 c powdered sugar and 2 T skim milk.